In the handbell world, the names Felix and Martha Lynn Thompson are synonymous with excellent music, hard work, and an unfailing commitment to the art of ringing. People certainly know the name Martha Lynn from her more than 250 published works and her dedicated service to the AGEHR over the years. And many ringers who have attended area and national festivals have had the privilege of ringing under Felix's more than capable direction. But what many people do not know is that their involvement with handbells has been anything but ordinary. Over 40 years ago, the Thompsons began a life together that would include the growth of a 20-choir musical program, gain national renown, and touch literally thousands of lives. Little did they know that what started as a part-time job directing a children's choral program at a Methodist children's home would turn into not only a career together but a musical legacy at the St. James United Methodist Church in Little Rock, Arkansas. 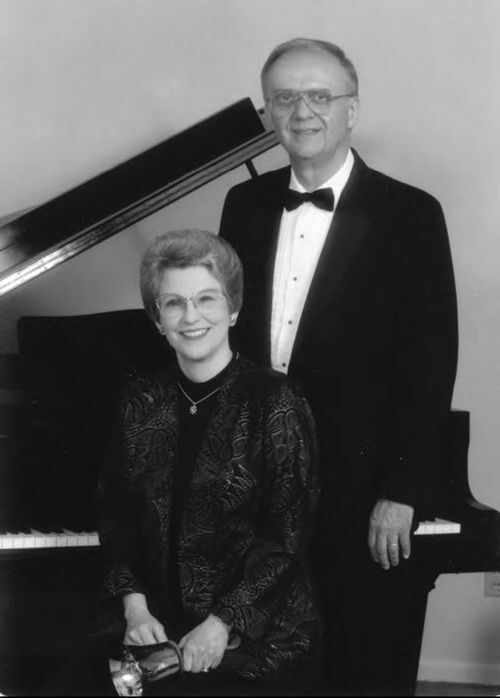 After 33 years of service at the church as directors of the entire music program, the Thompsons retired in 2002. Recently, I had the pleasure of visiting with them to talk about their long and successful partnership. OVERTONES: Can you tell us how you came to work in the music field together? MARTHA LYNN: We both went to the same college, Henderson State University here in Arkansas, we both taught junior high school choral music, and we were both involved in church music. He was teaching in Little Rock, and I was teaching in North Little Rock. He had just gone to St. Paul United Methodist Church as choir director; the church was looking for an organist; I was looking for an organist's job, and the church hired me. That was in 1962. FELIX: During that time, my salary with the school system was $2,800. Hers wasn't much more. To supplement our salaries, both of us also taught piano lessons. The father of one of my junior high students was the superintendent at the Methodist Children's Home in Little Rock, and in 1962, he asked us to begin a choir program for the children and youth who lived at the Home. MARTHA LYNN: At the start, we did only the choral program at the Home. The superintendent believed that every child should be part of a musical activity so he sent them to choir not long after they were able to walk! Everyone came at the same time--toddlers to teenagers--and we were supposed to teach them to sing. And then he volunteered us to do a television program! FELIX: We had probably had no more than three or four rehearsals when he asked us if we would like the choir to be on television every Sunday at 7:00 in the morning for a month. 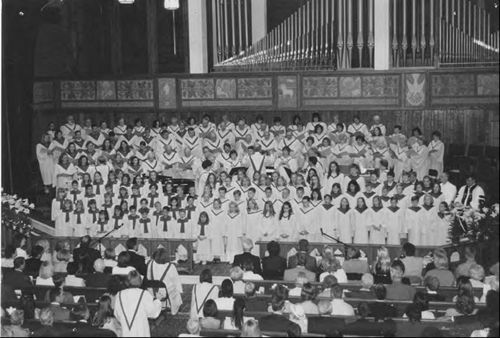 MARTHA LYNN: After doing the television programs, the superintendent thought it would be a good idea to take the choir to sing at Methodist churches throughout Arkansas. Although we were smart enough to realize it, this was part of his fund-raising plan. FELIX: We traveled to some Methodist church nearly every Sunday, usually going in a rickety old school bus! MARTHA LYNN: The children and youth sang, did choral readings, scripture readings, and lead the entire worship service. OT: When did handbells come into the picture? MARTHA LYNN: That happened in 1965 or '66. A Methodist minister's daughter died in a helicopter accident, and there were so many memorials gifts given to the Children's Home that the minister suggested buying something for the music department. When we said, "We hear that handbells are the coming thing," the superintendent said, "Order a set and tell them I want them here in three weeks." So we ordered a set, and they were here in about three weeks! Then the superintendent said, "I want you to play them in church soon." Soon meant in about two weeks! These children and youth didn't know anything about music, and we didn't know anything about handbells and we didn't have a clue as to how we were going to put this bell choir together. OT: I'm anxious to hear how you tackled that. MARTHA LYNN: In those days, there was very little published bell music, but reproducible music was included in Overtones. Basically these were hymn arrangements done by Guild members. It was very simple--basically two octaves or less, but it wasn't easy enough for our beginning ringers. We started without help from anyone. The book that came with our bell set said "you needed this many ringers," and the superintendent said, "you're going to have this many," which was more--so we arbitrarily made some decisions, not knowing if they were right or wrong. Our first idea was, "We'll color-code the music for them. Each note will be a different color." We started by putting simple one-line melodies on charts and making each note a different color. Well, we ran out of colors before we ran out of notes and no one could see yellow! This eventually developed into our system of marking and color-coding music. OT: How did things go then? MARTHA LYNN: Things went well. We organized two choirs, one for children and one for youth. 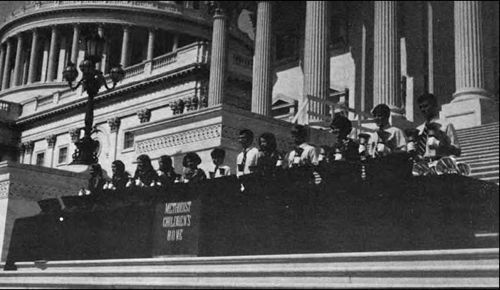 In 1967 we took the youth to the National Festival in Dallas. They were still playing very simple music, but they played it well. And they looked nice--they were all outfitted in blazers. Years later people would say, "I remember your ringers and how nice they looked." By the way, when we went to that first festival, the massed ringing music was given to us at registration! FELIX: At the Festival, someone from another choir came up to us and said, "You really play well, but you need to learn to damp." on Easter Sunday in 2000. MARTHA LYNN: (Laughs)--and no one had ever said that to us. FELIX: That was one of the first constructive things we were told, so we began damping! MARTHA LYNN: We took our ringers to a festival every year after that. FELIX: During the time we directed the music program at the Children's Home, we traveled over 32,000 miles within Arkansas, leading worship in many churches. MARTHA LYNN: This was good for them because they stayed in homes of church members and they had to learn how to behave (Felix laughs) and how to write a proper thank-you note. They were learning more than just music. FELIX: Over the years people have said to us, "I heard your children from the Methodist Children's Home on television at a time when I was very sick. I can't tell you what it meant to have those children come into my home on Sunday morning." Also, I never will forget what one of the children's teachers told me. He was one of her best students. After he gave his oral book report, she asked him, "How come you always do so well when you give your oral book reports? Why aren't you nervous?" His answer was, "I get up in front of hundreds of people every Sunday and play the bells, so why should I be scared of (the other kids)?" These young people learned so much more than music--things that they are now teaching their own children. We still keep in contact with many of them through mail. OT: So, you're directing the music program at the Methodist Children's Home and developing handbell choirs there as well. Where do your jobs at St. James come in? MARTHA LYNN: St. James was organized and started meeting at the Methodist Children's Home in 1968. The superintendent of the Home volunteered us to do the music at the church when we weren't traveling with the Home choirs and bell choirs. The church met at the Children's Home for about a year and was still meeting there when it was chartered in April of '69. We were doing the music for St. James, although we were still employed by the Children's Home. When the church moved into its new building, we were asked to become the first music directors. We saw this as an opportunity to build a program from the ground up. 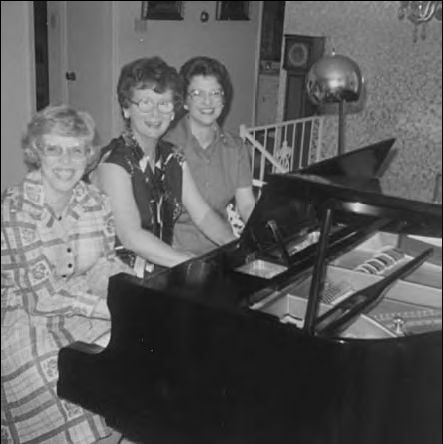 We officially became St. James' Music Director and Organist in October of 1970, and we continued to do the Children's Home work as volunteers. FELIX: We were in the right place at the right time. The Lord knew what he was doing in leading us into this area. In fact, we had applied at a large church here in town, and to this day we haven't been told whether or not we got the job. I wonder what would have happened if we had gotten that job! The Lord was leading us to St. James from the very start. OT: Naturally in the handbell world, the names Felix and Martha Lynn Thompson are synonymous with the instrument. But your jobs at St. James pretty much entailed the entire music program, correct? MARTHA LYNN: Yes, we did the entire music program. He did the adult choirs, I was the organist, and jointly we did the children's and youth choirs and the bell choirs. The handbell choirs were about a third of what we did. FELIX: You don't often find combinations like this in churches any longer--one or two people directing all the choirs. MARTHA LYNN: All these choirs were equally important parts of the Music Ministry, but the thing that made bell choirs so important at St. James was the effect they had on the lives of the ringers and what they could do to draw the people into the church and to get them involved in ministry. Many people came into St. James through the Music Ministry door--through the bell program. OT: Martha Lynn, you were once quoted as saying, "Any church that really supports a handbell program has at its disposal another tool for reaching its congregation at all age levels." How do you see handbells as an important part in reaching all age levels maybe as opposed to something else? MARTHA LYNN: Because it's a small group there are one-on-one relationships. You have to work to build relationships, and it's harder to do when you have lots of people in the choir. The members of the bell choir also have to help make it work. The first youth bell choir at St. James succeeded because one girl got off the school bus at the church and said to her friends, "Here's where we get off because we're going to bell choir today," and she brought some of her friends with her. Those friends got involved in the bells, and then their families joined the church. Many times it's the connection with the bell choir or the music program that keeps them involved in the church--it's a place where they feel safe. When they walk in the door, they know there are expectations, they know what the rules are, they know the rules are not going to change--and they know that it's a safe place. There literally have been youth who have come inside because something unhealthy was going on outside, and they knew they could come in and be safe. The ringers also become part of a team and they don't want to let the team down. In time, you begin to build a tradition. The ones who make the most responsible ringers today are the ones who grew up in the program and know what the rules are. FELIX: We have always had high expectations of our ringers. From the smallest ones to the largest ones, they all know that they are expected to be at bell choir rehearsal, and if they're not going to be there, we need to know in advance. We didn't have many absentees because the ringers knew that they were an important part of a team. I think that so often we don't expect enough from our ringers. We always had one piece of music in the folders that was a little harder than we thought they could do, but it was our challenge piece. We tried to keep everybody busy, and this was possible because Martha Lynn is so good at assigning bells. A bass ringer may also play a very small bell. This may be because that's the best place to assign the bell for that piece or it may be to keep the ringer busy and involved until the end of the piece. Ringers who aren't busy sometimes pester their neighbors! OT: How is it that you eventually became such movers in the handbell world? FELIX: I'm not sure that we ever were movers and shakers, but things really began to take off for our bell choirs when Martha Lynn began writing for them. There still wasn't a lot of published music, and one of our ringers said she was tired of going to festivals and hearing the same music over and over. "Why can't Mrs. Thompson write something for us?" That summer we taught at a Baptist choir camp, and the organist played a neat little piece of music to open the camp. It was John Bull's "Rondo in G." Instantly we thought that would be a great number on bells. MARTHA LYNN: But that wasn't the first one. Actually "Parade of the Wooden Soldiers" was the arrangement that got it all started. There is a funny story about that one. The original version of "Parade" was published by another publisher, but not knowing any better at the time, I sent my arrangement of it to the Guild. They rejected it--but then turned around and programmed it as a National Festival massed ringing piece! I was paid a flat price of $50 for the arrangement, never received any royalties, and have no idea how many copies it's sold. I never write a piece because I want it to be published. If a piece is published, that's "a plus." I write it because we need a piece for a particular choir or I find something that I think would make a nice arrangement for bells. This is not something I do to make money. It's something I do to share with others. OT: Are there any particular pieces or arrangements that have stood out as your favorites over the years? MARTHA LYNN: "Parade of the Wooden Soldiers" is of my favorites because it was an early one. There are a couple of interesting stories--one of them about a setting I did of the hymn, "Thy Holy Wings." I wanted to use a narrator so the text could be heard along with the music, but the translation in the hymnals is copyrighted. At the time, some friends had a Swedish exchange student, and they put me in contact with the student's father, who translated the text from the original Swedish for me. He and I worked on it together so that it made good sense in American English and so that it the translation could be sung to the hymn tune. He wanted no recognition or payment--he gave me permission to use it in any way I wanted. Of course, on the published music, he is given credit for the translation. Another arrangement that has an interesting background came about because we always watch the Vienna Philharmonic's New Years concert. One year they played a piece called the "Sperl Galop." It was the only piece on the entire program that was not subtitled. I didn't know how to spell Sperl. I couldn't find it anywhere, or so I thought. I just hadn't done my homework very well, but I thought, "It's only going to cost me the price of an airmail stamp. I'm going to write to the Vienna Philharmonic." That year, Loren Mazel was the guest conductor. I knew that, since he was American, he would understand my letter written in English, so I wrote and asked if he could tell me where I might find the music. Of course, I thought I would never hear from him or anyone else. About a month later, I got a package from Vienna. It was from the librarian of the Philharmonic, and inside was the entire orchestral score of "The Sperl Galop," sent "with the compliments of the Vienna Philharmonic." OT: Getting back to your career and your partnership at St. James. How has doing this all of your lives as a team been different than if you had taken each of your careers down individual paths? MARTHA LYNN: I don't think either one of us would have been as happy or as effective in our work if we had gone separate ways. In 2002-03 when he was sick and in the hospital several times, I realized then that I didn't enjoy working with somebody else as much as I enjoyed working with him. It wasn't that I didn't like working with other directors, but we have been a team most of our working lives. I think it's worked very well. OT: What are you doing now that you're retired? Are you enjoying it? MARTHA LYNN: He still directs the Alumni Ringers as a volunteer and I have two adult bell choirs. Last spring we started a six-ringer group basically to try out some things that somebody had asked me to write using the 12-bell concept. It's a different way of thinking and writing, but it's lots of fun. So--I'm still doing quite a bit of writing and I also do the engraving for most of my published pieces. Recently I've also been doing some free-lance engraving work for publishers, too. FELIX: I don't miss the stress and strain--or the staff meetings --but I do miss the association of the people we've worked with for so long. That's probably the biggest void and the most difficult thing about retirement. I especially miss the children and youth, but it's nice to be able to do the things we want to do at church, then walk out the door and leave the worries to someone else! Martha Lynn, right, with longtime handbell friends Betty Garee, center, and Fran Callahan. OT: Looking back on such a long and successful career, how close is this to where you saw yourselves going as college students. MARTHA LYNN: Not many bell choirs existed when we finished college, so we couldn't have known that they would become such an important part of our lives. Other than that, I believe I did what I started out to do. I'm not a concert organist and I'm not a recitalist. I'm a church organist and that's what I've enjoyed doing since I was in high school. I prefer doing behind-the-scenes work and letting someone else be in the spotlight as the up-front person. FELIX: After my second year in college I decided to change from working on a performance degree in music to earning a music education degree with emphasis in secondary school choral music. After graduation, I taught junior high school choral music for seven years, and during that time, for three summers I worked in a church as a youth director and music director. Even though I enjoyed teaching school, these summer jobs made me realize that I wanted to go into full-time church music work. It's a decision I've never regretted. Having the privilege to help organize a brand new church, to begin the St. James Music Ministry, to give it leadership, and to help it grow for 33 years was a once-in-a-lifetime opportunity. After retiring in 2002, being allowed to continue directing the Alumni Ringers as a volunteer is an added bonus!